The first cookbook that I ever read was a community cookbook that my mom owned. It was published by a local church and is one of the only cookbooks that she still has to this day. I vividly remember its pink glossy cover, black plastic spine, and yellowed interior pages. There were no photographs, but I didn't need them. I had no trouble imagining what the outcome of each recipe would be. As I became an adult and my love for cooking grew, so did my collection of community cookbooks which were given to me by family and friends. Tea Time at the Masters was gifted to me by my late aunt from Augusta, Georgia. Later, I received Savannah Style as a wedding gift. I still cherish both of them. 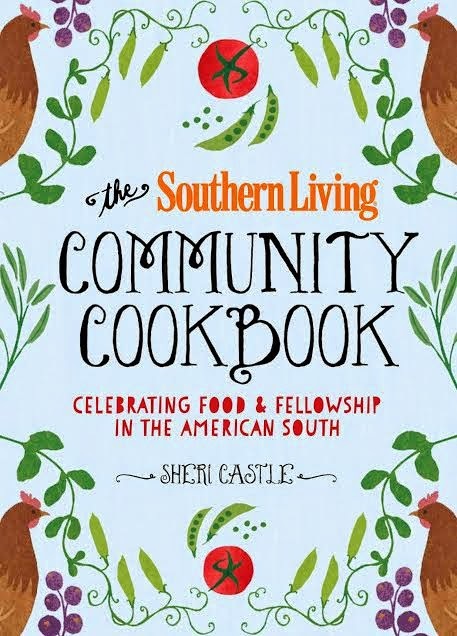 These two community cookbooks along with many others are celebrated in The Southern Living Community Cookbook by Sheri Castle, an author who fully understands the fellowship of food. The Southern Living Community Cookbook has a traditional layout which I always prefer, being old school and all. The recipes begin with appetizers and move through main dishes, sides, soups, desserts and baked goods and end with beverages and preserved foods. Being familiar with Southern Living, I recognized a few of the recipes here and there because I had prepared them in the past. I can personally attest to the quality of the Sausage, Bean and Spinach Dip and the Poppy Seed Chicken Casserole. There is not enough room here in this review to list all of the recipes that I want to try. 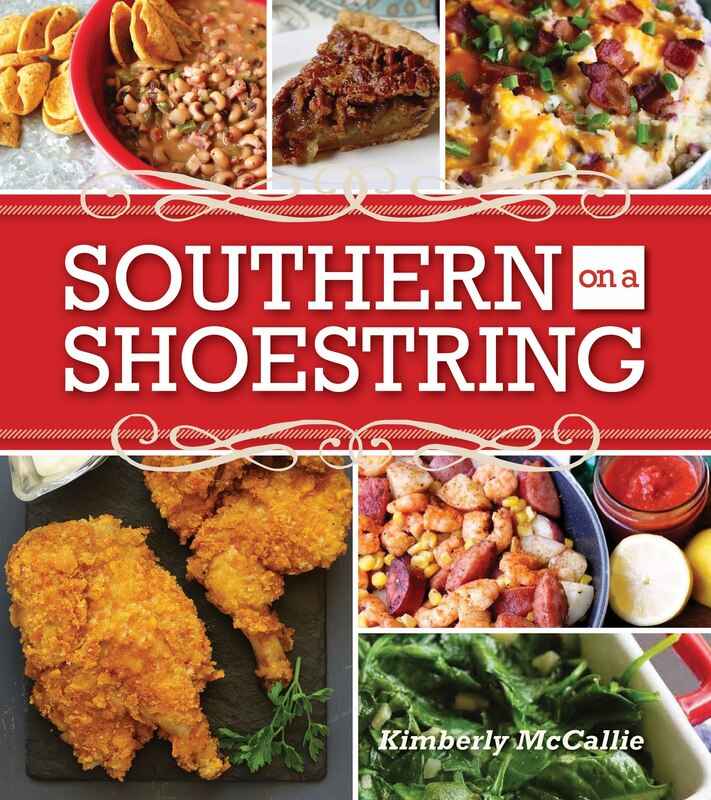 Just trust me when I say that this is the perfect cookbook for fans of southern cuisine. I won't keep you in suspense any longer. I absolutely loved everything about this book from the cover and interior art work to the selection of recipes and photographs to the incorporation of vintage recipes from cookbooks past. If I were to publish my own cookbook, I would want it to look just like this one, a visual masterpiece. What an impressive character it has! 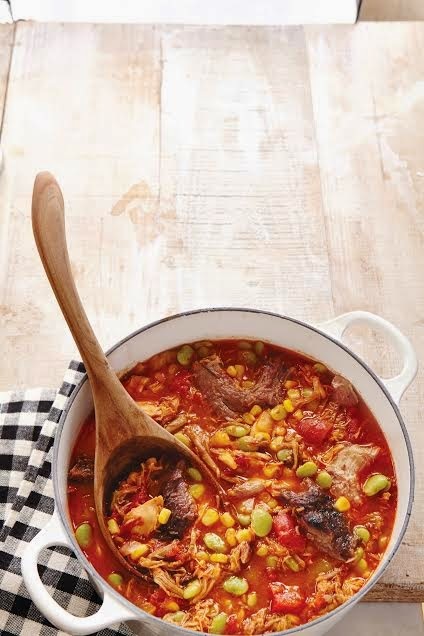 A couple of weeks before Thanksgiving, my husband decided that he wanted to add Brunswick Stew to our Thanksgiving menu. I thought it an odd choice, but I knew where to find the perfect recipe. We smoked, chopped, assembled, and simmered ~ a real labor of love. But, in the end, my husband ended up with the large pot of stew that he desired. We may have a new Thanksgiving tradition on our hands. 1. Soak wood chips in water for at least 30 minutes. Prepare charcoal fire in smoker; let burn 20 minutes. Drain wood chips, and place on coals. Place water pan in smoker; add water to depth of fill line. Remove and discard giblets from chicken. Tuck wings under; tie with string, if desired. Place chicken and pork on lower food rack; cover with smoker lid. Cook chicken 21⁄2 hours; cook pork 6 hours or until a meat thermometer inserted into thickest portion registers 155°. Let cool. Remove chicken from bone. Chop chicken and pork. 2. Stir together chicken, pork, tomatoes, corn, butter beans, onions, broth, ketchup, vinegar, Worcestershire, brown sugar, salt, pepper, and hot sauce in a 6-qt. Dutch oven. Cover and simmer over low heat, stirring occasionally, 2-1⁄2 to 3 hours or until thickened. Stir more often as stew gets thicker. Oxmoor House has been generous enough to provide me the opportunity to host a giveaway for my readers. One of you lucky readers will win a copy of the Southern Living Community Cookbook. The deadline for entry is Sunday, December 14th. Enter the giveaway at the widget below (may take a few moments to load). Good luck! I always look forward to eating dressing and cheese balls the most around the holidays. The different appetizers and snacks. Always love to try new recipes! Lady Baltimore Cake, a family tradition. I look forward to eating lots of cookies and my Grandmother's lasagna! Appetizers on Christmas Eve. Mom's recipe for stuffing which we ate at Thanksgiving. All the good food, family and friends together enjoying the season. Sounds like a great treasure. Desperately need this as hubby is from South Carolina. He says I don't know anything about his familys food. I've collected cookbooks for over 50 years and this sounds like a gem. Merry Christmas to all. I just commented but didn't say what I was looking forward to. Being a grandmother, seeing all the kids' concerts, SS programs, and their excitement through the season is precious. This is the first year we will not have a turkey or ham on Christmas. My husband and I decided to cook either pork chops or a pork loin so I am looking forward to this and trying to decide which one and how to cook it. Thank you!